I also write about money. If you’re interested in “living large on a small budget,” you can read my personal finance and frugality blog at Wise Bread. I went to Clarion, the science fiction and fantasy writers’ workshop, in the summer of 2001. I learned a lot and I had a great time. I’ve written a lot about Clarion in my Clarion Journal. I speak Esperanto and write in that language as well. If you speak Esperanto, you can read my Esperanto-language blog at Esperanto-USA. Whether you speak Esperanto or not, if you’re in the area and are interested, please come to the meetings of the East-Central Illinois Esperanto Club. For more information about my Esperanto activities, see my Esperanto website. I picked up two nice mentions for Wise Bread articles. Lifehacker, in a piece by Jason Fitzpatrick, linked to my most recent post, Plan for your wants, in an article that they called Plan for your wants to make budgeting enjoyable. And, in a piece by Farhad Manjoo, Slate included my post Not the sort of person who (along with mentions for Wise Bread in general and my personal site) among The best Web sites to help you scrimp through the recession. 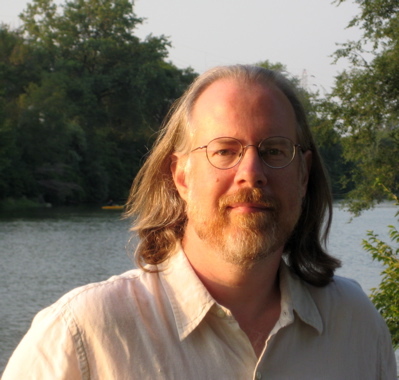 My brother, Steve, is once again organizing Esperanto-Tago, a day for everyone with a blog to post about language problems from their own perspective, bilingually–in their own language and in Esperanto. Two years ago, all kinds of people posted on all kinds of topics–immigrants, children of immigrants, people whose native language has a small number of speakers, people whose languages are not supported by the culture where they live. Everybody has some language problems, if only wanting to connect with people with whom they don’t share a common language. At the Esperanto-Tago page there’s support of various kinds, including support for hooking non-Esperanto-speakers up with volunteers willing to translate their post into Esperanto. If you’ve got a blog, think about the language problems that you face, and consider writing a post for Esperanto-Tago. 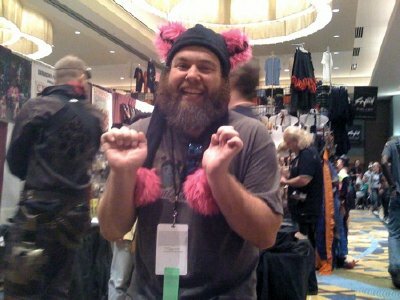 So, Toby had a little contest, where he asked for captions for this picture of Pat Rothfuss in cat ears. I’m not normally a contest sort of guy, but the prize this time was a copy of Sly Mongoose . I’m a fan of Toby’s work and had bought Crystal Rain and Ragamuffin in hardback, but my income has been a bit constrained since I became a full-time writer. I’ve cut back on book purchases, and Sly Mongoose was among the things I’d have liked to buy but hadn’t. So, I entered (with the caption shown), and I won! When the book came, I set aside Anathem to read it right away. (Seriously. As I said, I like Toby’s work.) Here’s some thoughts. I’m always a little cautious of books about a hyper-competent hero. It’s a kind of story that’s hard to do well. To provide some dramatic tension you either need hyper-competent villain or else you need to cripple your hero. There’s nothing wrong with doing those things–you just need to do them in an interesting way. Toby’s efforts to cripple Pepper (both physically and emotionally) serve the purpose in a craftsmanlike way. But his villains are where the story really comes to life. The floating cities of Chilo are in opposition, because it’s a hard place for humans to live–some are doing pretty well, while others are just getting by. In the greater universe, the Ragamuffins are in opposition to the Human League, because they have different visions for human progress. They’re both opposed to the alien Satraps (because they have a really different vision for human progress), but not every human is, because the aliens have a lot to offer an individual human. I’ll let you read the book to find out just whom the zombies are in opposition to (although I expect you can make a pretty good guess). Because I’m me, I always notice whether a novel has the economic underpinnings done well, and Toby does a great job with that–the tough life in the floating city of Yatapek, and the better life in some of the more prosperous cities. It’s good stuff–illuminating the story, while staying in the background where it belongs. If you like space opera, big battles, spiffy weapons, cool aliens (and cool alien places), and stories of tough people doing their best in difficult circumstances, Sly Mongoose is one of the best new books out there. Zombies are just an extra special bonus. Ron has kindly let me host his fascinating peak debt paper on my site. Is there a limit to how much Americans can spend? Clearly there is: All they earn, minus savings and service on their existing debt, plus new borrowing. Since the Bureau of Economic Analysis puts numbers on those very items, it’s possible to see just how close we are to the edge. In a fascinating paper, Ron Laszewski does exactly that. The results are rather depressing. Whether you read my Wise Bread piece or not, if you can follow the math, I urge you to read Ron’s paper itself: peak-debt-pd-020708. Jackie and I scouted a possible bicycling route that Steven and Lucy could take from the Days Inn to our apartment. My brother has been paying close attention to Find the Lost Ring, because of the way Esperanto is figuring in the game. At his urging, I took the quiz, which showed me as “sofia.” The flash dohicky the provided to show it on the blog, though, messed up my page, so I took it down. Since I started writing for Wise Bread (because each post I do there needs a picture), I’ve taken a greater interest in my own photography, and in the creative commons. I’m taking my own photography more seriously, simply because it matters more. More people see my pictures—and a really good picture can bring traffic to a post. I’m taking the creative commons more seriously, because it’s provided me with a number of cool pictures for posts where I didn’t have a picture of my own to use.